Widely regarded as the greatest escape artist of modern times and as one of the most exciting sideshow performers in the world today, David Straitjacket is a truly international performer. During the last ten years he has astounded audiences around the world with his unique combination of sideshow, escapology, comedy and drama. 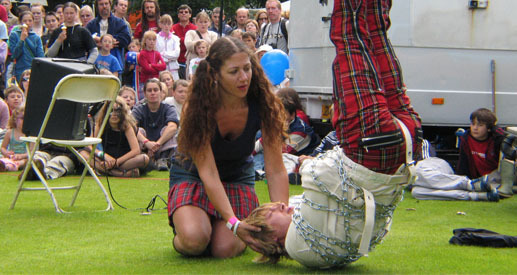 David’s skills have brought him a total of Eleven Guinness World Records™, and led ‘Ripley’s Believe It Or Not™’ to dub him, “The Modern Houdini”. 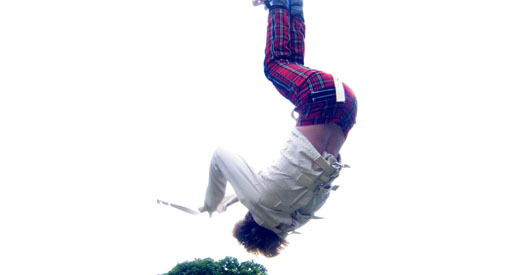 He regularly appears on television as a performer and also behind the scenes as an expert trainer and stunt advisor. His shows are suitable for a wide variety of events, festivals, corporate events, cabaret shows, promotions, sales and product launches, theatres, casinos, colleges, universities and more. David has more than a decade of experience performing at events around the world. David is also one of only around 50 performing sword swallowers in the world. His shows include sword swallowing, amazing sideshow routines, and incredible escapology. He is also able to produce large scale stunts for any event. This is circus cabaret for the 21st century. Real stunts, no magic tricks and no illusions. David’s shows are as funny as they are exciting. He is well known for his razor sharp wit and his ability to leave even the quickest of hecklers standing! He appears frequently on national and international television, on radio, in magazines and other publications and is currently planning several large stunts and world record attempts. So whether you are planning a festival, corporate event, nightclub show, student night, or any other occasion which requires something special and unique, well, you’ve come to the right place! "A night of guaranteed entertainment"
"The best guest on the show so far"
"I thought that you were wonderful"
"One of the greatest escape artists alive in the world today"